Lionel Scaloni as coach of the Argentina team. 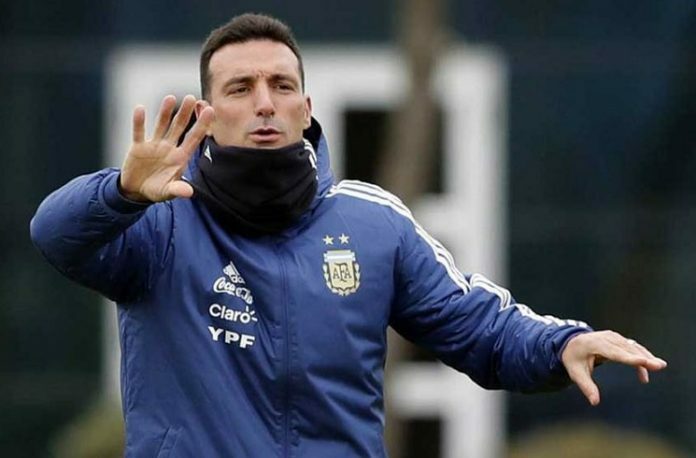 AFA president Claudio TAPIA has stated that Lionel SCALONI might have a chance to remain as coach of the Argentina national team. “When the cycle started, the chance didn’t exist. But the people ended up identifying with this Argentina national team and it could be decided that they (Lionel SCALONI’s coaching staff) could have a chance. We all want the best for Argentina and if this process continues to grow, we have to take advantage of it. “I’m happy with SCALONI’s work. It wouldn’t be crazy for him to coach at the Copa America. We don’t have to go crazy, we know what our objectives are and the closest thing is the Copa America. It wouldn’t be crazy if he were to coach. Let’s see how Scaloni is gonna put together his tactics against Mexico. A gud team out of the options which are available. Now he have a core base. So now we can slowly rebuild on that core. Copa America is a tough ask. We won’t win it. We r years behind..
I’m not a being pessimistic, but there isn’t much to be optimistic about. We beat Guatemala 3-0, hooray! But Guatemala, mind you, was playing their FIRST game together after a THREE year ban from football! Should’ve been at least 5-0, at least. 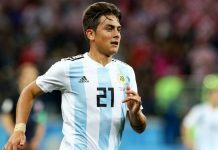 We beat Iraq 4-0, with a 2017 Ballon D’Or nominee (Dybala) in the team. But both of those teams are ranked very low, and with the “quality” these young players have we should’ve destroyed these teams at least by 5+. Now onto the top 20 teams we faced. We drew 0-0 against Colombia, having only 46% possession. Pretty much nothing to take out of that game, except the fact that it was boring to watch. We lost 1-0 against Brazil, having a pathetic 37% possession and only 1 shot on target. Basically, we parked the bus against Brazil… and still lost! Attack and midfield were a disappointment, only defense shined. Long story short, under Scaloni, we have yet to score against one of the top 20 teams in the world. If we fail to beat Mexico, another top 20 team in the world, much less score on them, Scaloni should NOT be the coach next year. It would show that he is picking the favorite players, but is a s*** tactician. Also, saying that it’ll be different when Messi and Aguero join, that’s the same excuse we had when Spain raped us 6-1 under Sampaoli, that Messi, Dybala, Di Maria, Aguero weren’t there. We’ll be right back to square 1 with Messidepedencia, only difference will be with younger players, but same story all over again. Personally, the only good that Sampaoli and Scaloni has done is give minutes to younger, much needed talent, such as Taglaifico, Pavon, Paredes, Saravia, Pezzella, etc. Had it not been for Sampaoli, Tagliafico, Pavon, Lanzini would’ve never played for the national team. Also, Scaloni with Saravia, Martinez, would’ve probably not have had the chance either. But now we need a tactician to guide these players, to give Argentina an identity, a style of play to even have a shot of winning the Copa America, and the World Cup in the future. They have been discovered, great! Now we need someone to lead them, instruct them to better the team play, and I truly believe that Scaloni is NOT that guy. Scaloni has done very very little to show that he is tactically competent offensively. I mean No disrespect to some mundos users but prioritizing “call ups” over tactical aptitude is a dangerous game. Simply calling up new faces isn’t good enough to win Copa. Let’s hope Mexico regains form to truly test Scaloni. 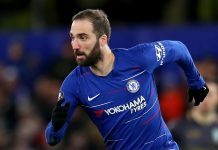 If not, he may stick around when he shouldn’t have and these next few years will be the she old story with Arg managers.. Vamos! It is now almost clear that Scaloni will stay at least till Copa! Excellent decision by AFA! Hope that some magical may happen in shaa Allah! Lamela is said to be called up for Mexico friendly. Yeah, not too thrilled about Mercado but Scaloni played as a right-back so he must know something I don’t. He was going to call up Montiel. But with River players out he takes Mercado except Saravia (Bustos out?). Still think the 2 names for RB position are Saravia and Montiel. Situation is clear: if only Scaloni’s team will do well against Mexico, Scaloni will stay atleast for Copa. I’m body and sould for him. I wonder if they can find a referee for the Copa final. I think Colombiano Wilmar Roldan of yesterday’s Palmeiras – Boca is so good referee. Best in South America. The finals will take place 7 and 21/28 November or 10 and 24. That will be our 25 title in CL. Brazil have 18. Argentina – Brazil 2:0 in semifinals of Copa LIbertadores. I like it. Palmeiras – Boca 2:2 and we have Superclasico in the final of Copa Libertadores for the first time in history! WOW thats gonna be insane, Which is the Venue?? Its called Super Classico for a reason. One of the Top 5 must see Football Rivalries in the world. Its gonna be awesome. After some years the Super classicos seemed to be back, on track with quality players like Armani, Pavon, Pity, Palacios etc etc. on both sides. Yes the quality is there: Montiel, Benedetto, Quintero, Borre… Few foreigners of Boca also will going to Europe after the edition. The most Sane decision from AFA ( if this becomes true) since appointing Sabella in the helm 7 years back. Let Scaloni Continue the Rebuilding process which he is doing really articulately by giving game time to almost all the payers that are being craved for( specially in Mundo :)) . This decision can also calm down Scaloni and give the required confidence with which the team can take further steps forward. However, permanent coach must be appointed post Copa ( Unless Scaloni wins it for us) and before the qualifiers. By that time the we would have a fairly good idea about the core players who can carry the baton till 2022 or even 2026. Tactical Superiority comes with experience ,my Friend. Scaloni is a newcomer but it looks like that the young kids are liking his approach. Moreover, Walter Samuel and Aimar are also there to help him out. They are looking a solid combo and the team looked happy over the last two tours. Secondly, No renowned coach is ready to wear the crown of prickle right now. So it’s better we continue with Scaloni till copa which and let him work in peace. The trio are doing a appreciable job. Finally some wise words from the AFA. The troika of Scaloni, Aimar and Samuel should stay. If it happens, a good decision, there is obviously lot of room for improvement but Scaloni is a young coach who will improve tactically more and more with each phase. Frankly speaking, I haven’t had a confident looking defense (in particular) and midfield too since long time. Even against a top class Brazil size they held their own ground. It will take time to grow, but it may be one of the better decision AFA took in last 2 or 3 years, and a decision for the longer run. Same for me because of pity , Gonzalo montiel , exiquel palacios , armani. I’m slightly for River too for the same reasons. Too much foreigners in Boca. Though I like Benedetto. Oh, and the second reason – I want Independiente to stay as most titled club of Copa Libertadores. I Boca will win they got their 7 title as Independiente. Also Scaloni sounds bloody damn wise and composed when he faces the press. Perfect man to deal with argentinian supporters. Not to mention his interesting player selection. One we should never let go! Foyth with a incredible block today. Played really well. Pablo, I think in the Libertadores final I’m rooting for your team. He scored another nice goal in a moment when Palmeiras begun to spread their wings after second goal. that’s retarded. Tata’s time as coach is long gone and we don’t need him back! It is time for a new era, and a better coach! Also, Messi didn’t say anything, it’s fake news.